Part of the reason I am putting this here is because there appears to be some misinformation about this. When Do Unto Others came out it added a third home for 3 more outfits. This left the Law Dogs, The Flock, and the Lost Angels as the only groups with out a third home. The Flock had been destroyed and The Lost Angels had just been introduced, so they had good reasons. The only reason the Law Dog's didn not get their third home was bad timing. A new Law Dogs home had been slated for the next set. So Alderac Entertainment group took the home that they were playtesting in house and released it to the public. I have seen this erroneously called a fan card. Alternatively, this has been attributed to the "Town Council". It was neither. 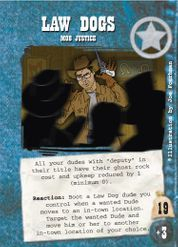 It was an actual, officially released Doomtown card. The original release was a fairly low quality PDF file. I was unable to hunt down the original PDF, but it was converted to a JPG image, as seen on your left. Several fan groups were unhappy with its presentation and made their own version, which may be why there is confusion with respect to its official-ness. There are two common versions of Law Dogs: Mob Justice. On the Left, we have the version designed by the Doomtown Future Squad. Both contain the original unaltered text, but have better quality art for the viewer/player's enjoyment. 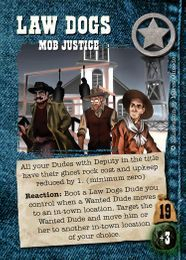 Unhappy with the existing choices, Harrowed Entertainment Group decided to take a run at Mob Justice. They acquired original art, and made a unique version of the card, being the only one ever printed, AND was made into a wooden home! They were handed out free during the late 2012 HEG Tournament Season. It is as yet unknown if they will be handed out during future seasons. As with other versions of LD:MJ, it is legal for all forms of play, as the printed card, or if you print it up yourself. All Versions LD:MJ are legal for all forms of play, be they the wooden card, the printed card, or if you print it up yourself, as long as they are identical to the original AEG version in regards to text. I am hesitant to include this here, as this is what causes even further confusion, but I would be remiss not to discuss this somewhere. 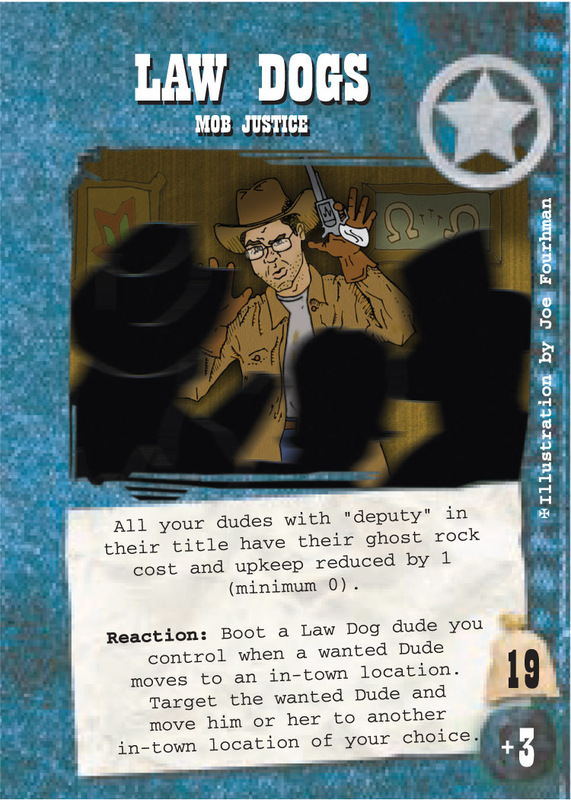 Unlike Mob Justice, and as opposed to what you might read on the internet, this is NOT a real card. This is a card designed by the winner of the 2004 US Championship at Gencon SoCal, Mike Zaret. Some group calling themselves the town council (who I have had a ton of trouble finding anything solid about, so if you can give me a lead, I'd appreciate it) gave it the go ahead as a "Beta Card" and it found it's way into Gatling Engine. 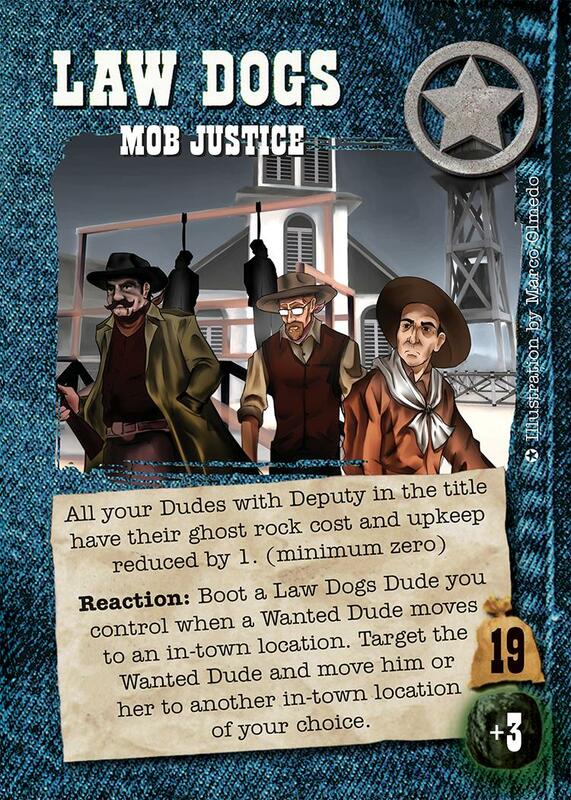 Because of the Digital only release of Mob Justice, the "Town Council" approval, and it's inclusion with GE, people have erroneously believed this to be a card designed by AEG and released as a "real card." 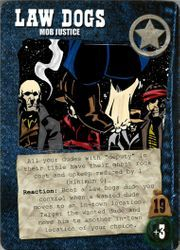 On Gamesmeister's Forums it was introduced that the community should review that card and try to approve it for play, but the topic died off. Harrowed Entertainment Group remade this card as part of The Champions Project. 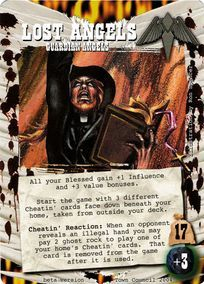 Their version has original art and was approved by Mike Zaret as a more balanced card. He was happy with the result. I recommend checking it out! So to reiterate: NOT A REAL CARD. NOT FROM AEG, NOT LEGAL.